After the jets hit, stairwells became the sole means of escape for thousands of WTC occupants. But design choices hampered full evacuation—and made the descent even more harrowing. It’s hard to imagine that the disaster at the World Trade Center on September 11, 2001 could have been any worse. And yet for one simple fact—the time of day—it would have been far more deadly. 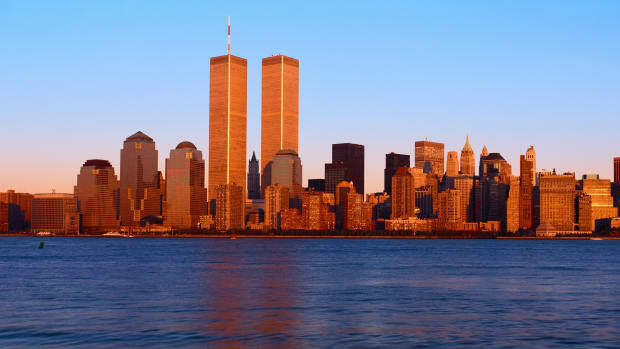 Had the attacks occurred later that morning, when the number of occupants in each tower would have swelled to nearly 20,000, fatalities would have been significantly higher. As many as 14,000 people could have been killed—many not by the plane attacks themselves, but by trying to exit the buildings. They would have died because of intense overcrowding in the tower stairwells where, safety experts estimated, it would have taken four hours to get out, much longer than the buildings stood prior to their collapse. Most people use stairs every day, never giving them a second thought. When it comes to life safety in the event of a fire, they become one of our most critical lifelines to survival. That was especially true in the World Trade Center that day, since the elevators quickly became a non-option. 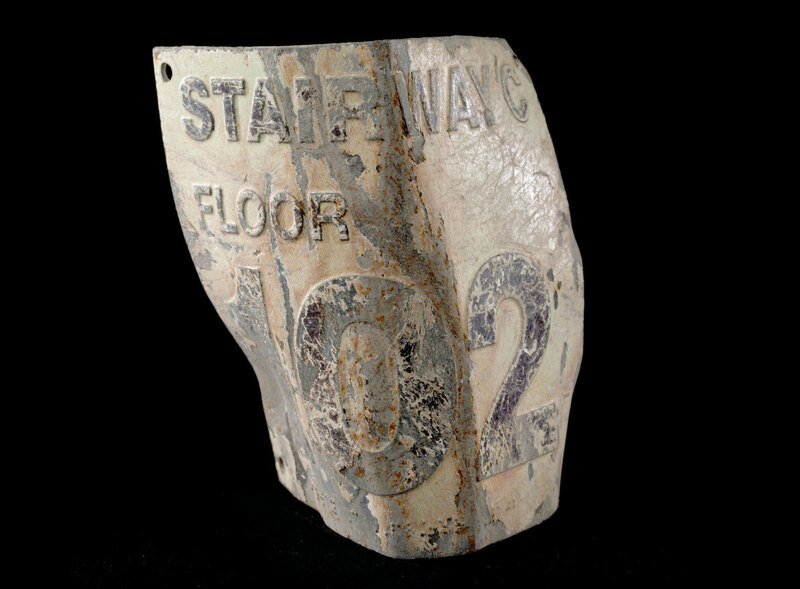 One of two stairwell floor signs from World Trade Center known to survive, from the 102nd floor, recovered from Ground Zero. Whether you went up or whether you went down...whether you went left or whether you went right...that decided whether you were going to live or die that day. —Jonathan Weinberg, Baseline Financial Services, South Tower, 77th floor, on deciding which stairwell to choose. The stairs in the twin towers were, to a great extent, a product of their times. 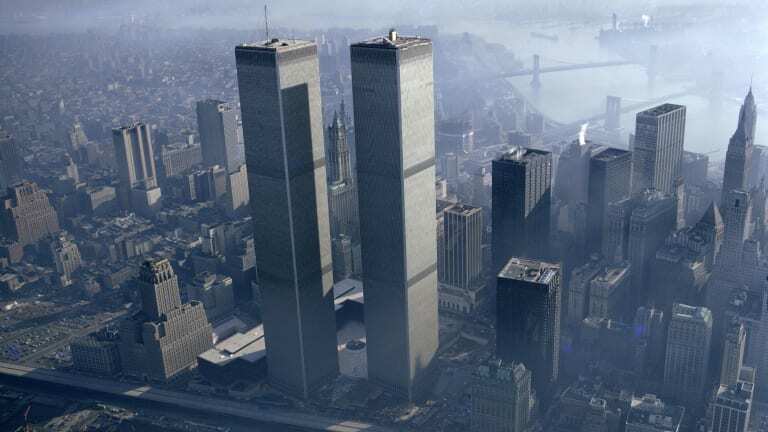 In 1968, as construction on the towers was beginning, New York City issued a brand-new building code, allowing for substantial reductions in egress capacity from the previous code dating to 1938. It appears that the buildings’ owner, the New York Port Authority (now known as the Port Authority of New York and New Jersey), took advantage of this fact, providing only three stairwells in the center core of each tower, instead of the six that would have been required under the older code. Labeled simply A, B and C, the stairwells encompassed the buildings’ entire height; two were 44 inches in width, one was 56 inches wide. The fact that the buildings’ designers wanted wide-open floors without columns and other obstructions meant that the three staircases, bathrooms, elevators, and other service elements were all placed in the same central area of the massive one-acre floors. In the case of the north tower, the stairs were approximately 70 feet part; in the south tower, they were about 200 feet apart. But what wasn’t there on 9/11 was a fourth stairwell in each tower, one that would have led from the Windows on the World restaurant in the north tower and another from the observation deck atop the south tower. These two high-occupancy spaces, each exceeding 1,000 people, needed additional egress capacity. But those code-mandated fourth stairwells didn’t exist because the New York Port Authority chose not to include them; the Port Authority was, and continues to be, exempt from actually complying with New York City’s building code. When American Airlines Flight 11 struck the north tower at 8:43 a.m., it bulldozed everything ahead of it as it passed through floors 93 to 99. A combination of jet fuel and building contents were ignited, resulting in a large body of fire. The destruction wasn’t limited to the burning offices and conference rooms; the plane destroyed each of the three very fragile gypsum-board walls enclosing each staircase. Gypsum-board sheets, a.k.a. drywall, are among the most common materials used in buildings to construct partitions; while they provide a level of fire resistance when constructed with studs between sheets on either side, they have very little lateral strength compared with a wall constructed of concrete. On 9/11, the drywall disintegrated on the floors of the impact zone when it was hit with the plane and building debris. As a result, all escape routes for north-tower occupants trapped above the point of impact, including hundreds who were relatively uninjured, were eliminated in seconds. With no way to get out, they were killed when the tower collapsed. In the south tower, the situation was different. As United Airlines flight 175 crashed into the floors 75 to 85 at 9:03 a.m., it too destroyed everything in its path—with one important exception around the 78 floor. The 78 floor comprised what was called a “sky lobby,” a location where occupants could switch from express to local elevators. Since it entailed large amounts of elevator-hoisting equipment on the 78 floor (and the floors immediately above and below it), the lobby provided a protective shield around the “A” stairwell. This one stairwell, while not in perfect condition, offered an option to escape from above the point of impact. 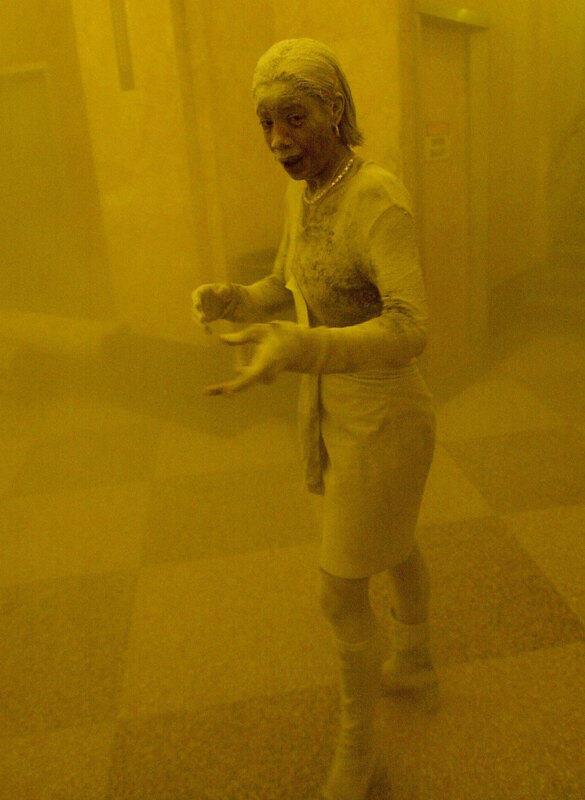 Marcy Borders, a 28-year-old legal assistant working for Bank of America, seen covered in dust while taking refuge in a nearby office after the collapse of the World Trade Center on September 11, 2001. She had escaped from the 81st floor inside the North Tower during the time of the attacks. Even though the lone “A” stairwell in the south tower survived the attacks, it didn’t guarantee that the hundreds of trapped occupants would know to use it. Instead, many individuals heeded the instructions given by 9-1-1 telephone operators and earlier building-wide announcements to stay put, in what’s known as a “defend-in-place” strategy. Under virtually every other conceivable high-rise fire scenario, this is a solid protocol that has saved many lives; keeping people out of stairwells and inside compartmented areas on their floors is usually much safer than descending down a staircase that can become a smoke-filled chimney. However, 9/11 was a very unique situation where people should have been told to leave. As a result of a court-ordered release of the 9-1-1 operator tape recordings (through a lawsuit initiated by The New York Times and supported by several 9/11 family members), we know that there were large groups of victims calling 9-1-1 for help on their cell phones. They were told to stay in place, of which the overwhelming majority complied. The fact that the “A” stairwell was passable and very few individuals used it emphasizes the importance of getting such critical life-saving information to those in immediate danger. About 15 survivors actually descended from above the point of impact in the south tower; had they been questioned about their egress path when they emerged from the stairway at ground level, their escape information could have been relayed back through 911 operators to those still trapped. By calling them on their cell phones, perhaps hundreds more could have made it out alive. Hindsight, of course, is always 20/20. But as in any disaster, it is critical to analyze what actually happened and learn from it. When we got into the stairwell is when we encountered a lot of white smoke… and we had to hold hands… It was really, really dark... Somebody said they wanted to light a match. Something in me said: Do not light a match. —Florence Jones, then-employee of Baseline, who with her colleagues surmised that what they thought was water on the stairs was likely jet fuel. I don&apos;t even know what happened. I was walking down the stairs and the next thing, everybody is knocked to the ground and there&apos;s this ringing sound in my ears. The entire stairwell was rocking, swinging like as if you&apos;re on a ferris wheel... I&apos;m afraid the stairs are going to fall out beneath me. —Henry D’Atri, on what it was like in the south tower&apos;s stairwell as Flight 175 crashed into the building. For those who found themselves below the points of impact in each tower, their escape was still a harrowing experience. They had to contend with a variety of conditions: collapsed ceilings, destroyed partitions and the like. In some locations, water from broken water pipes rained down. On the floors immediately below the impact floors, they also encountered fire and smoke, likely from some of the jet fuel that poured down from the decimated floors above. Once these escapees made it into the stairwells, they found a variety of other issues. In some cases, the stairwells were intact and well lit. In other cases, they were dark and slippery from water and jet fuel. 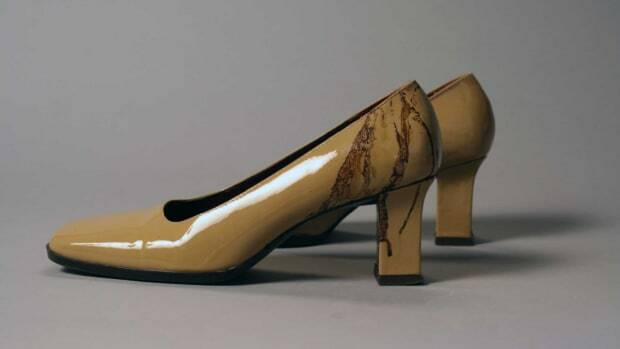 On the lower floors, evacuees had to contend with shoes discarded in the stairwell by individuals seeking to move more quickly. 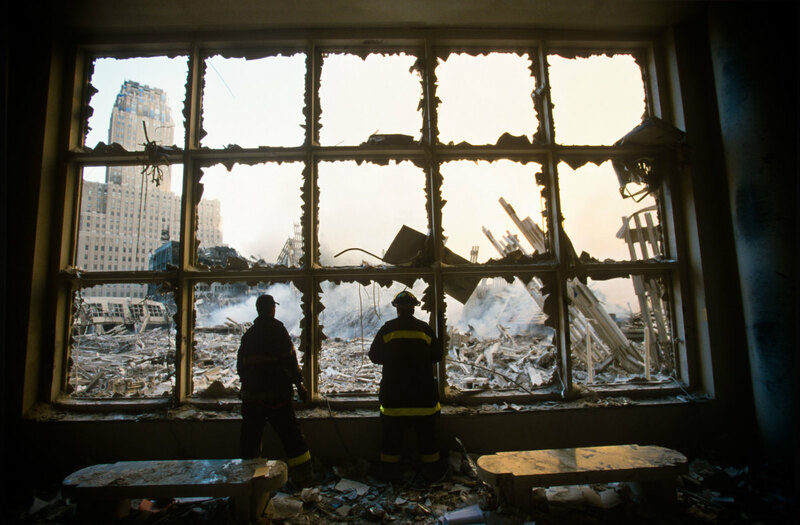 The rubble of the World Trade Center following the September 11 terrorist attacks. Once we hit 69, it was just...a step a minute. —Arthur Lee, then-employee of Bank of America, on how overcrowding in the stairwells slowed the descent. For many evacuees, the 44-inch stairwell width played an important role in their descent, leading to congestion. This was primarily caused by two conditions: disabled/slower evacuees (an estimated 1,000 individuals on 9/11) and the counterflow of firefighters ascending the stairs on their way up to attack the fire and help evacuate people who needed assistance. In high-rise office buildings nationally, 44 inches has been the minimum-required staircase width for several decades, based on the assumption that a person’s average shoulder width is 22 inches. So, with two people side by side, 44-inch-wide stairs became the required minimum width. However, it has been known for decades that 22 inches was narrower than actual average shoulder dimension and yet building codes, including the 1968 one, continued to use this inappropriate number. On 9/11, this mundane fact led to people having difficulty descending the stairs, particularly when they encountered disabled and slower-moving individuals. In some cases, evacuees actually left one stairwell and went to another staircase in order to more swiftly get out of the building. This situation was particularly apparent when individuals in wheelchairs struggled to get out, carried by groups of coworkers, strangers and firefighters. The narrow width caused challenges for firefighters too. Carrying well over 50 pounds of equipment while making the climb up the stairs meant they not only had to contend with exhaustion but also had to squeeze by the terrified occupants. The need to turn sideways to let each other pass meant that both groups, firefighters and occupants, were dramatically slowed. As we go down, the entrance to the 68th floor is open [and people are standing around, deciding what to do]. I’m like: You gotta get out of here! A woman steps aside and I see this woman in a wheelchair… I said ok, let’s bring her down, thinking we could get her down in the motorized wheelchair… It wasn’t meant to go down the [narrow] steps [with a person on either side]. —Mike Benfante, then-employee of Network Plus, who together with John Cerqueira transferred the woman to an evacuation wheelchair and carried her down 68 flights of stairs. 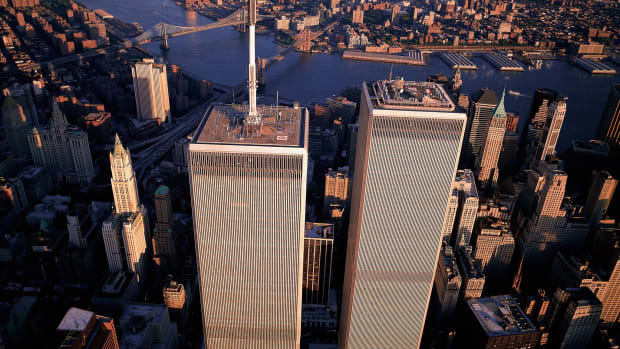 Despite the encumbrances of the narrow stairs, the National Institute of Standards and Technology (the federal agency charged with investigating the disaster at the World Trade Center) estimated that 99 percent of the occupants below the points of impact in both towers survived. The remaining 1 percent includes a high proportion of individuals in wheelchairs who had to be carried down the stairs, although some wheelchair users were rescued from as high as the 69 floor, carried by hand all the way down. It has also been reported that the Port Authority of New York and New Jersey had purchased more than 100 “stair chairs” prior to 9/11, chairs with tracks that slide along the edge of stair treads. No one knows how many of them were deployed that day, since accounts of disabled survivors and fatalities point to most of them being evacuated in traditional wheelchairs, not stair chairs. One notable set of stairwell survivors were the firefighters of Ladder Company 6. As the firefighters descended within the north tower, they encountered a disabled woman who had difficulty climbing down stair “B.” They assisted her, carrying her the last few stories, when the building collapsed around them. 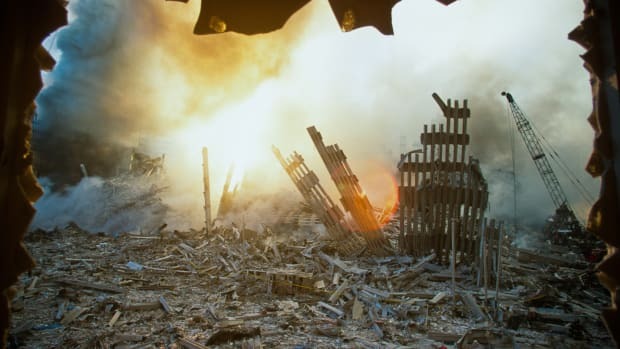 Miraculously, their small group ended up being the only survivors within the stairwells of the north tower after it collapsed, somehow emerging from a pocket of rubble. 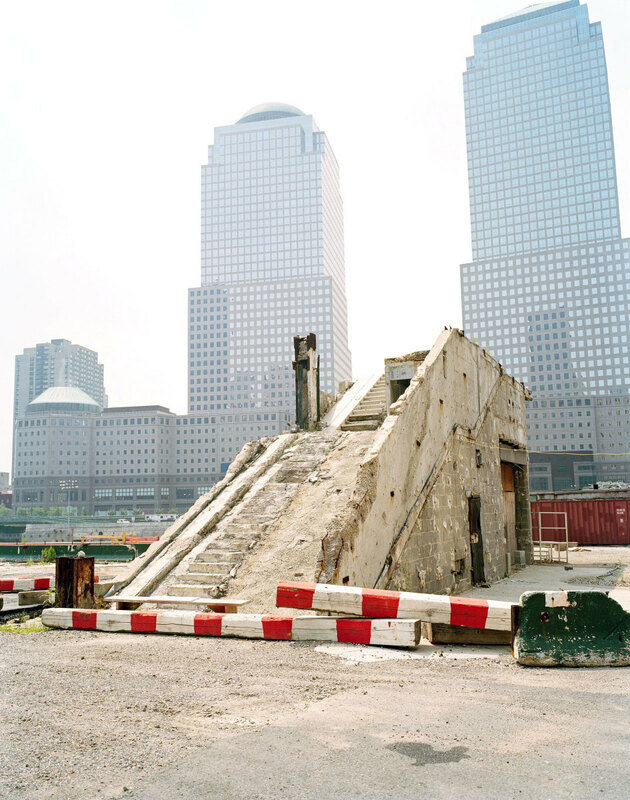 A concrete stairwell, one of the few surviving pieces of the World Trade Center, at Ground Zero in New York City, 2006. We started feeling this suction that blows open the fire doors of the stairwell... It filled the space with debris and noise and just chaos. And these heavy fire doors are flapping like they’re made of paper. —John Cerqueira, then-employee of Network Plus, who was carrying the wheelchair-bound woman together with Mike Benfante, describing the scene inside the north tower stairwell just as the south tower was collapsing. In retrospect, the disaster at the World Trade Center became a lightning rod for a variety of building-safety issues. Fire protection for steel, firefighter-communications systems, sprinkler-system water supplies, elevator use and dozens of other concerns became the focus of a federal inquiry under the then-newly created National Construction Safety Team Act. The law, enacted to study building disasters—and modeled on National Transportation Safety Board inquiries into plane crashes—authorized the National Institute of Standards and Technology to investigate the World Trade Center collapse and related issues. One issue the institute examined was the evacuations of the towers, including the design and use of the stairwells on 9/11. It became clear that egress from very tall high-rises had to be rethought, recognizing that the building itself must structurally survive a significant incident long enough to either control the incident or evacuate everyone in the building. 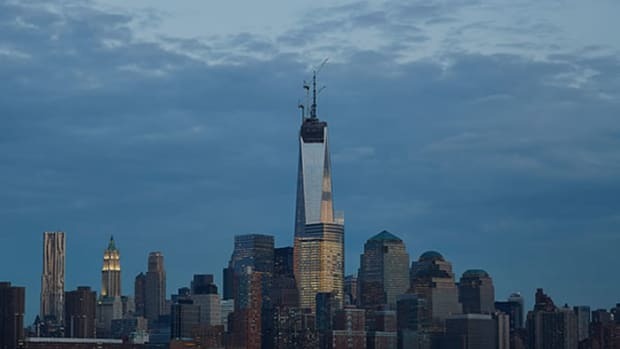 Since 9/11, national building codes have changed to include requirements such as providing an additional staircase, or a specially protected elevator and elevator shaft that can be used by building occupants for buildings over 420 feet high. Blast-resistant stair-shaft walls are also now required for high rises over 420 feet high. Photoluminescent markings, to glow in the dark when the normal lighting goes out, is now required for all new high rises. Ironically, the need for wider stairs—going from 44 inches to 56—only found its way into one of these two national building codes. Unfortunately, it isn’t the code under which most new high-rises across the United States are being built today. And that includes New York City. Glenn Corbett, an expert in fire protection, is an Associate Professor of Fire Science at John Jay College of Criminal Justice in New York City. Corbett served on the federal advisory committee to the National Construction Safety Team that investigated the collapse of the World Trade Center towers and testified before the 9/11 Commission. He serves as technical editor of Fire Engineering magazine. *All first-person accounts are drawn from the documentary 9/11: Escape from the Towers.